Another sunny day and a successful one too, scoring five out of six quarters. Plenty of firsts again with all of the band scoring firsts in the Union triples. 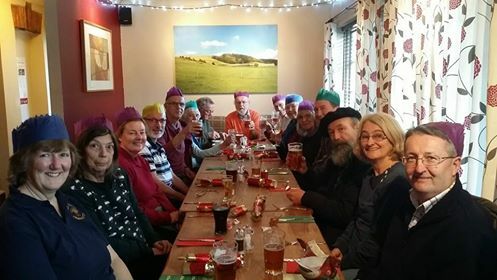 The Christmas lunch was at our usual venue of the Cricketers at Shroton (below). It was hard to move on to our afternoon towers but we managed to drag ourselves away. The next day out will be on Monday 19th January 2015. This entry was posted in News, Quarter Peal Days.